Since 2005, Wilson has been saving the red water-resistant envelopes because she was "originally intrigued" by their "unique texture," according to Netflix's DVD.com. By this spring, some 13 years later, she had amassed over 1556 of them. Well, Netflix celebrated their 20th anniversary this year and she shared her collection by using their #DVD20 hashtag on Instagram. The company was impressed and immediately contacted her to learn more. She told them she was hoping to turn her collection into a dress and they jumped on the chance to sponsor its creation. So, Joanna started looking for a dress designer and found 19-year-old Alyssa Hertz, a Kent State University fashion design student who had already created dresses out of newspaper and styrofoam. To come up the inspiration for the dress, Joanna (who is a historian of Christmas entertainment) looked to Rosemary Clooney's long red gown in the 1954 movie White Christmas. We had a meeting to discuss how we could take inspiration from this famous gown and decided on replacing the fur on the dress with white roses made from envelopes that I painted white, making slight changes to the neckline and sleeves, and adding a dramatic train to finish off this grand dress. We had two fittings while I worked on the project, and a final fitting after it was complete, which I couldn’t have been happier with. I cannot even begin to count how many hours I spent on this from the middle of August to the beginning of October, or how many sticks of hot glue I used. I can, however, tell you how many envelopes and flowers I used in total! This dress has 526 paper flowers on it and I used a total of 693 DVD Netflix envelopes for the flowers and the dress itself! Another fun fact is that I spent so much time using my hot glue gun on this dress that near the end of the project, it actually caught fire. I had to buy a new one to finish the dress! 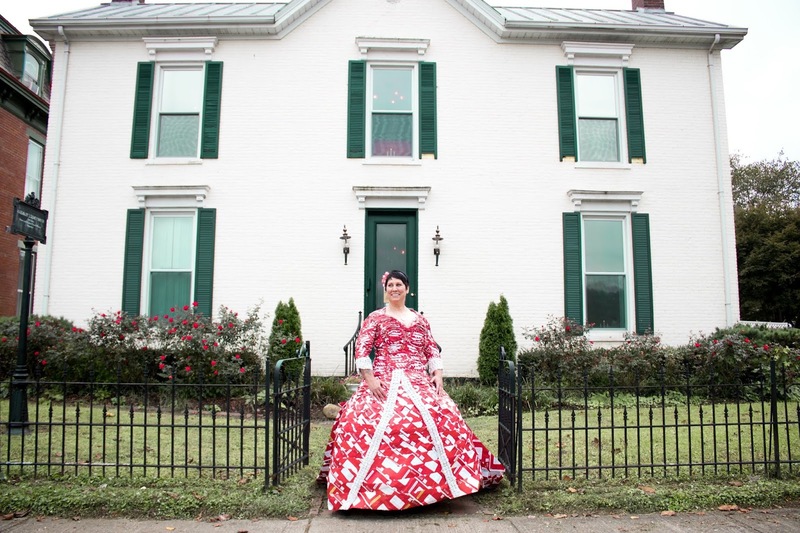 After it was completed, Joanna and Alyssa traveled with photographer Keisha Lenee to the Rosemary Clooney House in Augusta, Kentucky to get these shots (and more). Joanna told DVD.com, "It was so exciting to see so many people interested in our project and want to know the motivation behind making the Netflix DVD paper dress. I felt a little shy wearing the dress and posing for photos with strangers, but I'm also proud of the work Alyssa accomplished and honored that people find this project as fascinating as I do. This has been an unforgettable experience." Now, if my calculations are correct, Joanna has over 800 red envelopes left, enough to make something else. Maybe a cape? Or a red "carpet" for her to walk on?